Hey friends! 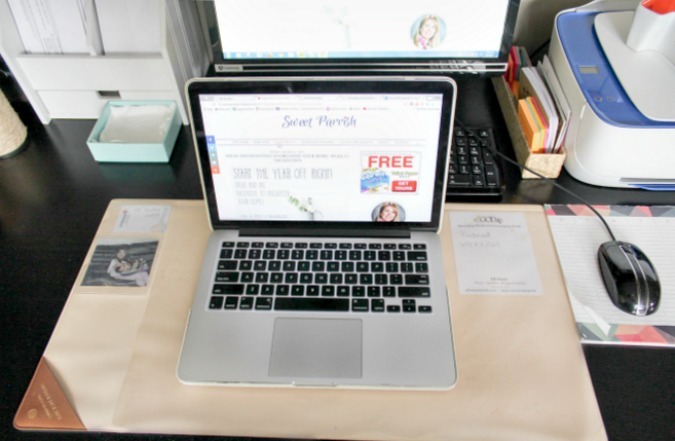 I am so excited for today’s post because today marks the second week of the 4 week declutter and organize your home challenge. We started with our kitchens, and today, we are moving on to our craft/office space. This challenge is hosted by myself and the rest of my friends from No Place Like Home. There is just something about the start of a brand new year that makes me want to get my home in order and purge, purge purge! 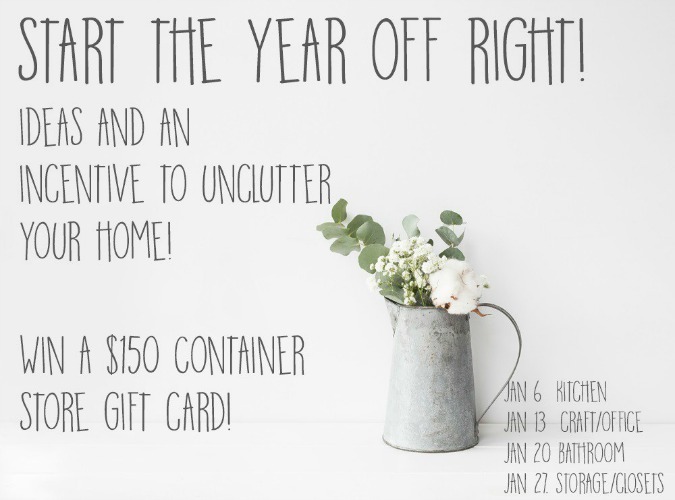 Not only do we have some very useful tips and tricks for you to help you get your office/craft space organized, but we are hosting both a link party and a giveaway for a $150 Container Store gift card! 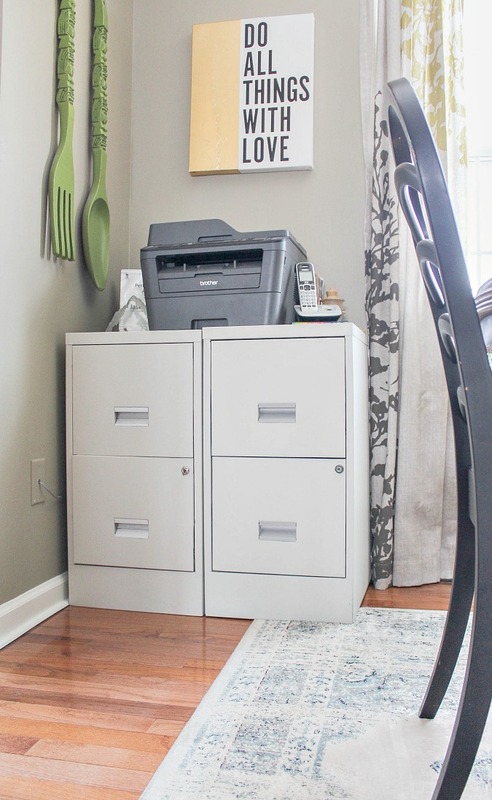 We invite you to please link up your kitchen, craft, and office organization posts, or if you do not have a blog, you can just link up a picture if you like, and then be sure to enter to win the gift card! And please mark your calendars so that you can be sure to join us for the rest of the month, when we will focus on a different area in our homes each week. 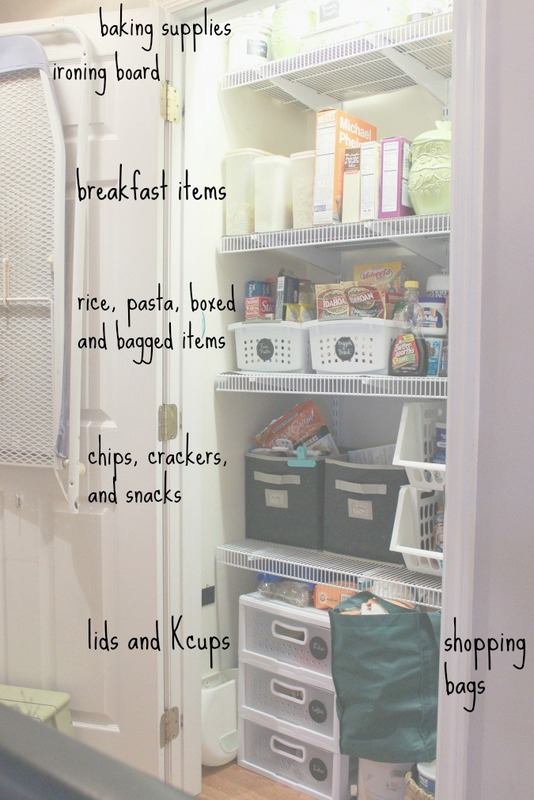 Also, please be sure to visit each of the other hosts at the links below to see how they have organized and decluttered their kitchens! If this is your first time visiting Sweet Parrish Place, welcome! I am so thankful and happy that you are here! You may or may not know this, but our dining room serves double duty as our office. It isn’t the most ideal situation, but we have limited space in this home, so we have to make it work. So this little corner of our dining room is our desk area, and the picture directly below is the finished space after a large purge, declutter, and organization. This room is one of the most used spots in our entire home, every single person in the family uses this space, so it has lots of different functions. And below is this space before. 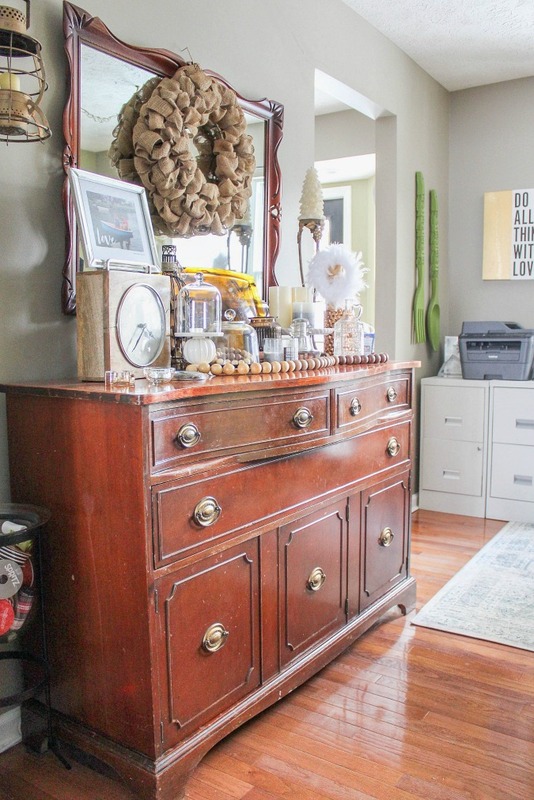 It wasn’t too awful before, but there are other spots in this room that received a major declutter, so keep reading! 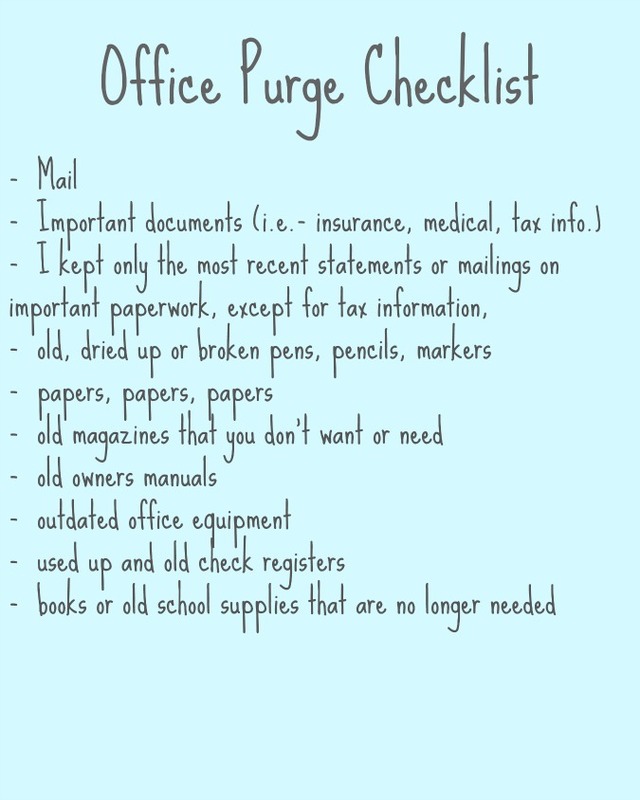 Last week I shared a kitchen purge checklist, and this week I am sharing an office purge checklist. 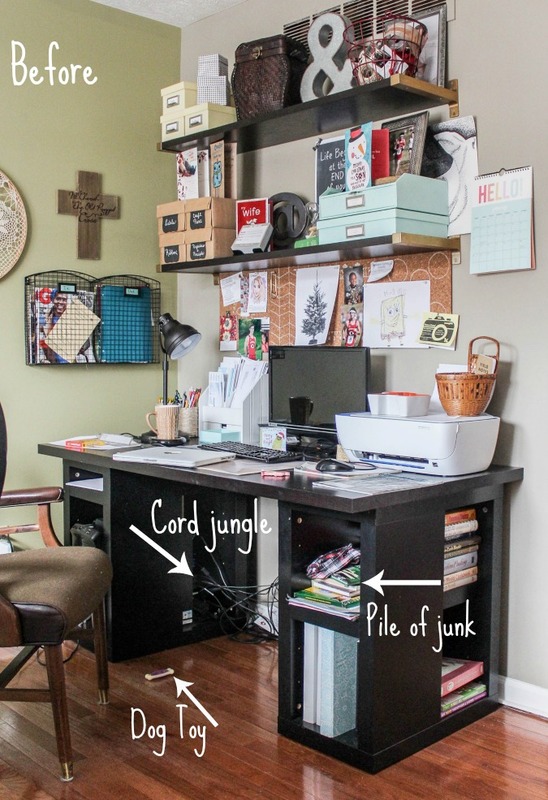 I hope this list will inspire you to get started decluttering your office space! 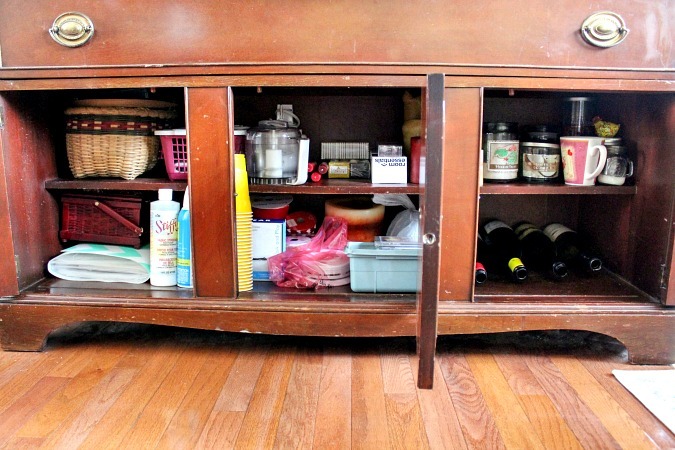 These ar some steps I took to get me started in purging and decluttering ours. This desk is where homework is done, bills are paid, games are played, and the Internet is browsed. And it becomes cluttered very quickly, so it is something that I am constantly having to straighten. Below is another before shot of the desk area. 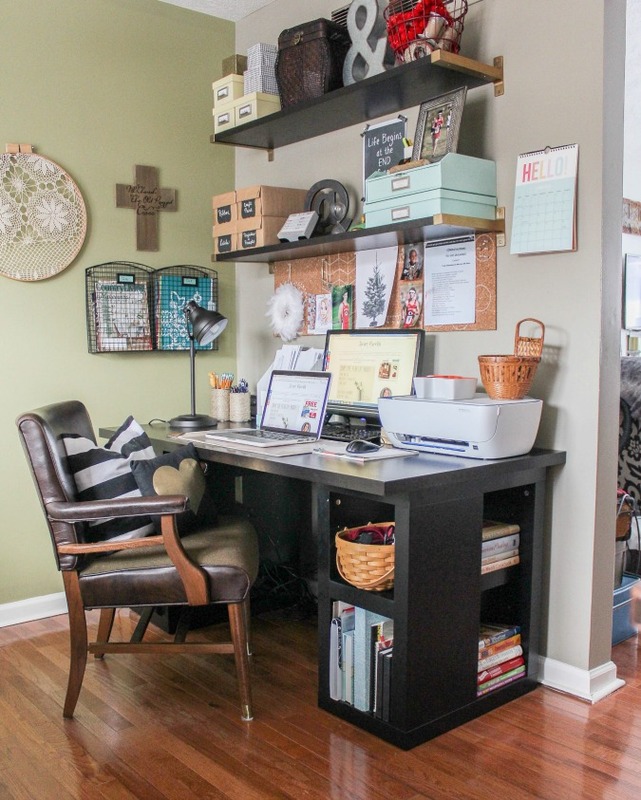 The desk and the shelving above are all from Ikea. On the top shelf there is an antique egg basket, and it contains more ribbon. I have to admit, I have ribbon in three different containers here in this room. I have a lot of ribbon, and maybe one day I will come up with a better plan, but for now this is working. And here it is free of the clutter. Much better, right? 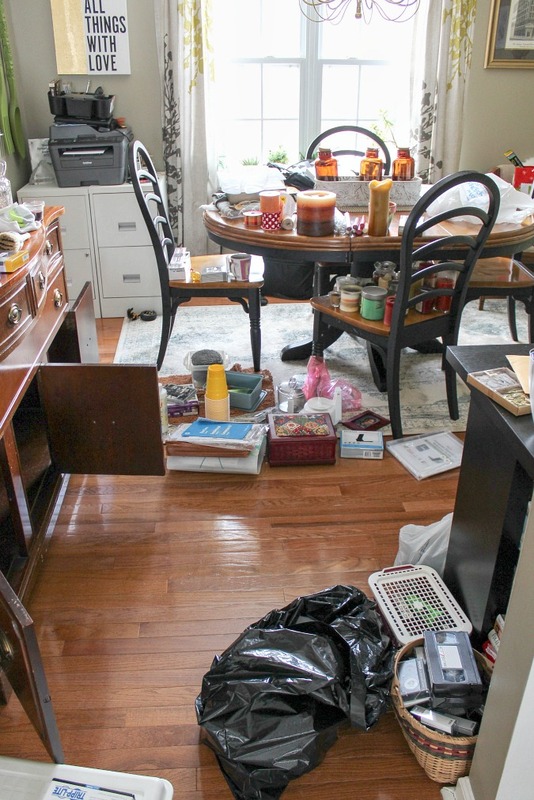 The boxes to the left hold craft supplies that are used frequently. 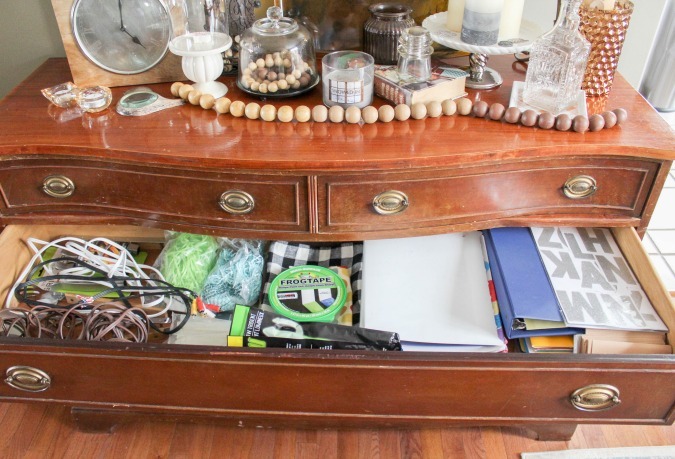 I have a large cabinet downstairs that I use for craft and decor supply storage, and you can read all about how I did that right here. The yellow boxes house small paint brushes, tape, and markers. They were purchased a few years ago, and I added the metal label plates to them. I covered the shoe boxes with brown craft paper, and they hold ribbon, craft paint, labels, and check registers and receipts. The quote that is taped up on the wall in between the shelves is a free printable I made, and you can print one out for yourself by clicking here. 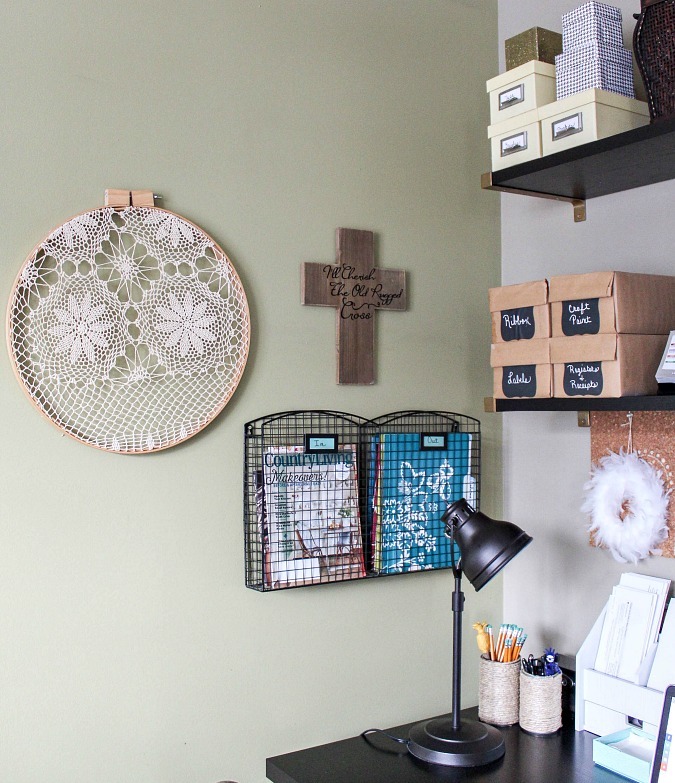 This wire basket that hangs on the wall is a place I put magazines when they come in the mail, and on the right there are some file folders that house important papers that come in and go out of the house. Each of the kids has two folders. One labeled out, and one labeled in. Out means that these things need to be returned or some type of action needs to be taken. In means things that can stay home, like report cards, test scores, etc. And those things are dealt with when the folder get filled enough that I decide to do something about it. I have a large Rubbermaid box downstairs that holds all of the kids school related papers and scores. There is stuff in there for each of them starting in kindergarten! And I keep piling it in. I have a dream that one day when each of them is grown, I will go through it all and make them a nice little keepsake of some sort of all of the things I saved. These aqua colored trays/drawers contain envelopes and checks, and small crafting supplies that I use frequently. 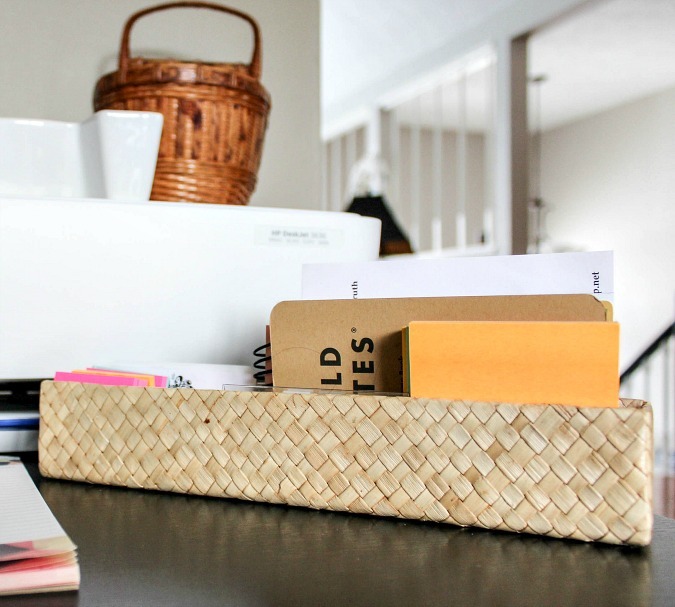 This oblong basket was in some type of gift basket we once had delivered, and it is the perfect size to hold post it notes and other small notebooks. It is convenient to have small things right here on the desk to jot down notes when needed. This is a bunch of junk that has piled up on this shelf for months, so I purged, put things in their places, and added a medium sized basket to coral some of the things that normally accumulate here. Much better, am I right? Oh the wonders that a simple basket can do! Most of the stuff on this shelf was put in it’s proper place, and now this basket hold chargers and things like that. looking at these pictures, I realize that I need to wipe down the sides of these shelves because I can see finger prints and it is driving me mad! 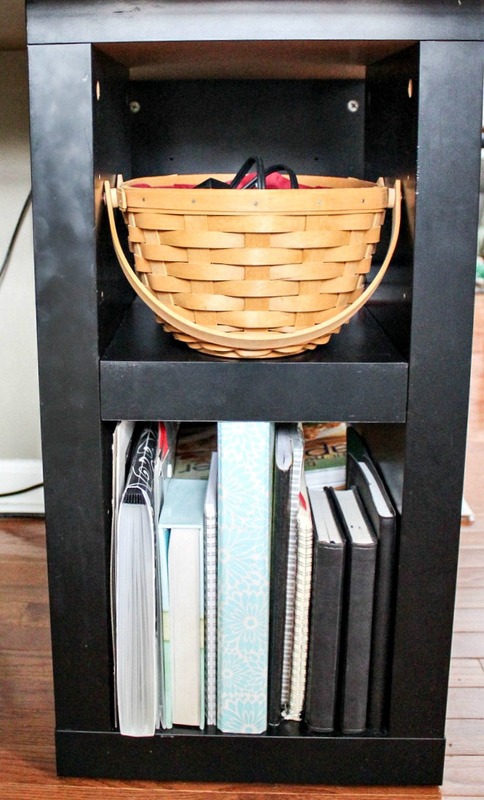 This is where I keep my cookbooks, and I decided to purge some of them. I’d say I donated 3-4 cookbooks. Honestly, I rarely use cookbooks nowadays because of Pinterest, but I couldn’t bring myself to part with all of them just yet. And the one that says American Cooking on it was the first cookbook I ever received from my mother when I got married at the age of 22. I used it constantly back then. So it’s a keeper! This is another corner of the dining room/office. You may have noticed that we have two printers. The one here is my husbands, and it belongs to his employer, he is required to have it, but it is only black and white, so we have another one on the desk that is color. 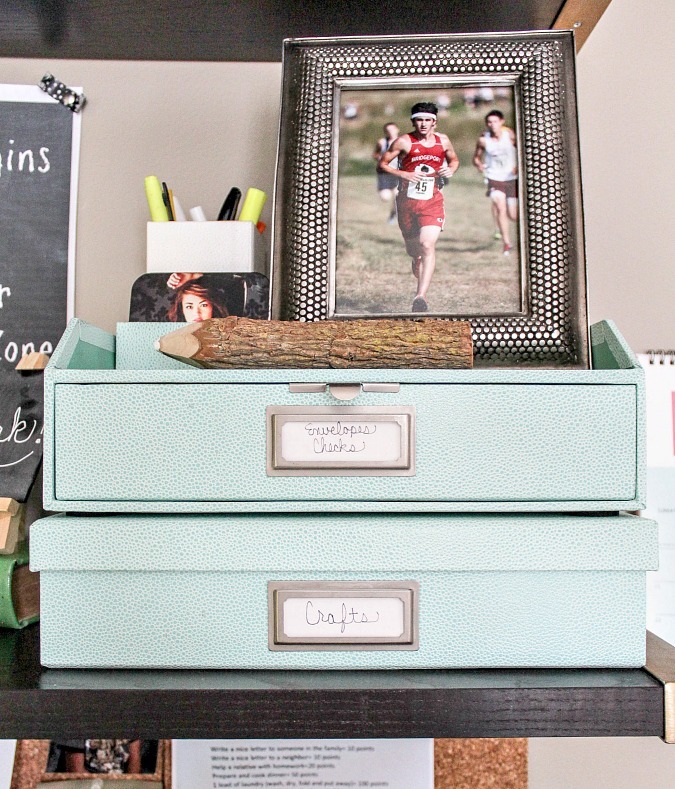 I found these two file cabinets at a thrift store last summer and gave them a makeover. We desperately needed the extra storage in this corner. 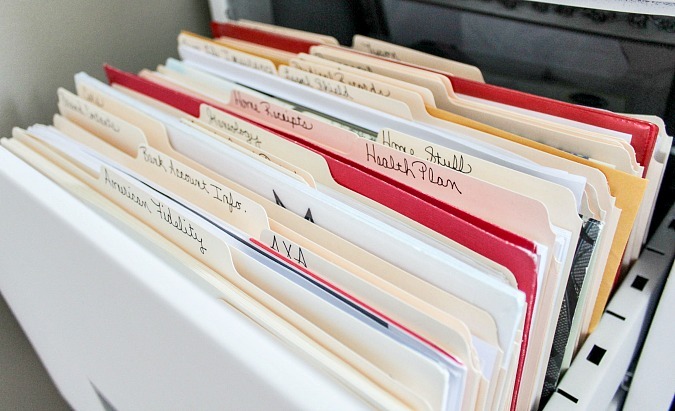 And having these file cabinets has changed how we do business around here! This large bin sits on one of the end tables in our living room, and every time we obtain any kind of paperwork that needs to be kept or seems important, it got shoved in here. This bin was overflowing! I actually shot this picture after I had began the purge. 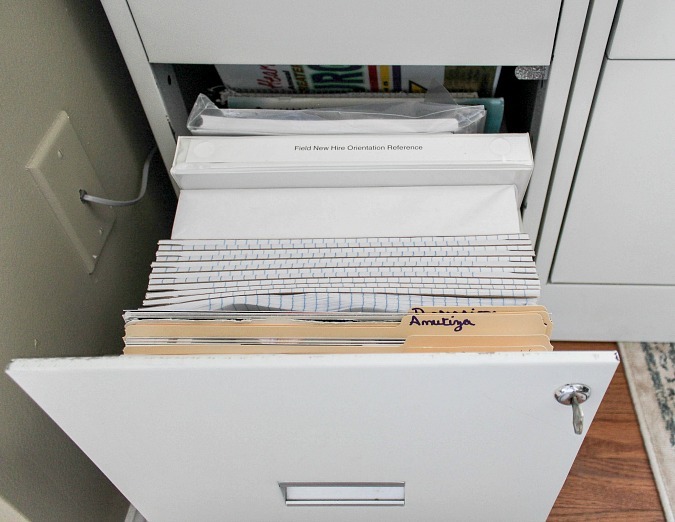 But everything that I kept was filed away in the file cabinet. And good news, now this bin is empty! So I plan to use it to hold a few throws or pillows. and the paperwork will now go directly into the proper file. 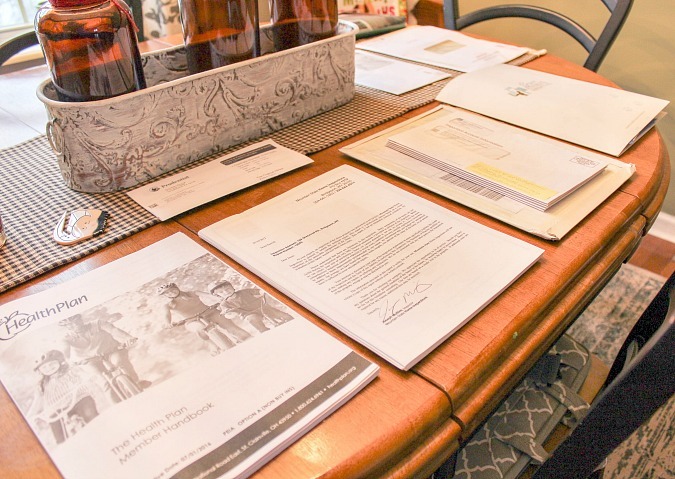 When I began purging this paperwork, I started by opening it and stacking things in categories on the dining table. Once I was finished and the bin was empty, I then went through and kept the most recent statements or mailings, and threw the rest away. I did keep all of our tax information. None of that was tossed. 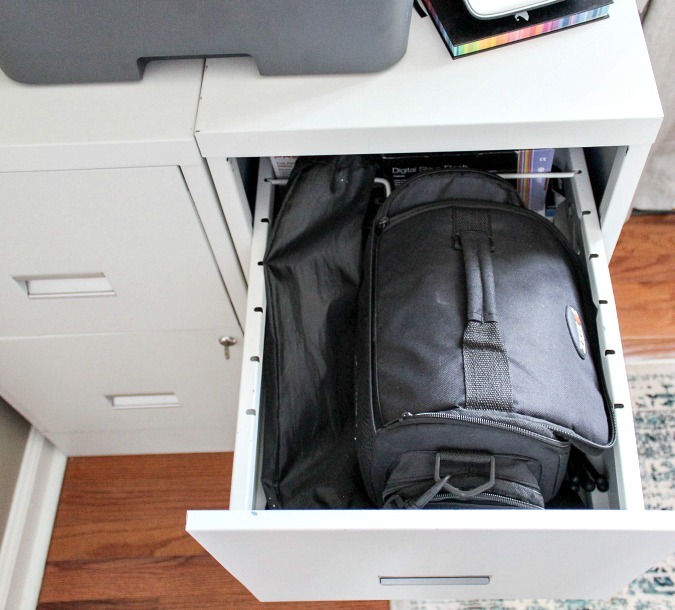 The top right of drawer holds my camera bag and other camera equipment. It is very easy to access right here, and before I had no designated spot for these things. This drawer contains a shoe box that my husband uses to collect required work receipts. And he has to log them every so often I believe. This drawer holds some of my husbands work supplies. He is a pharmaceutical rep, so he doesn’t have an office that he reports to. And this drawer holds everything that I kept from the bin above. I feel so good to have a place for all of this instead of a giant heap of mail! 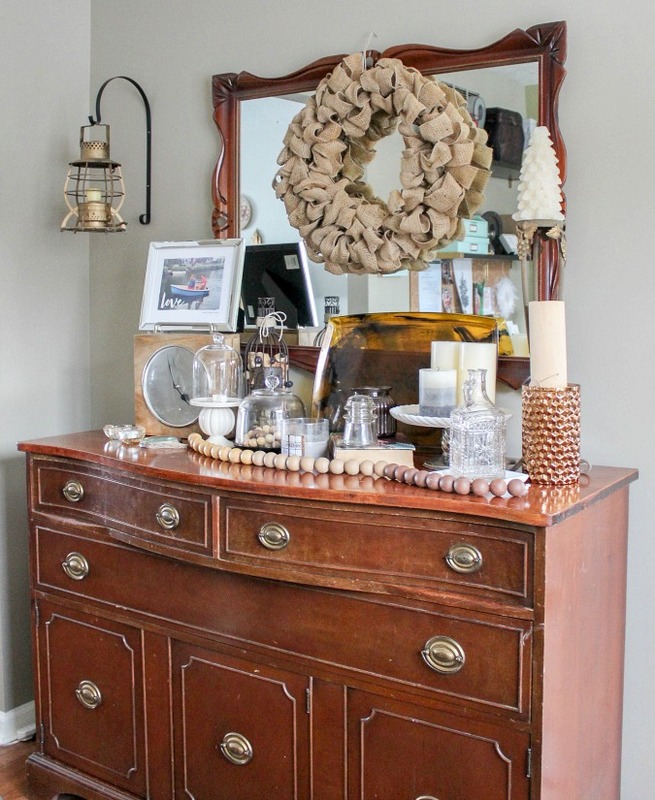 You might guess that this buffet holds linens and such, but it’s not quite that fancy! 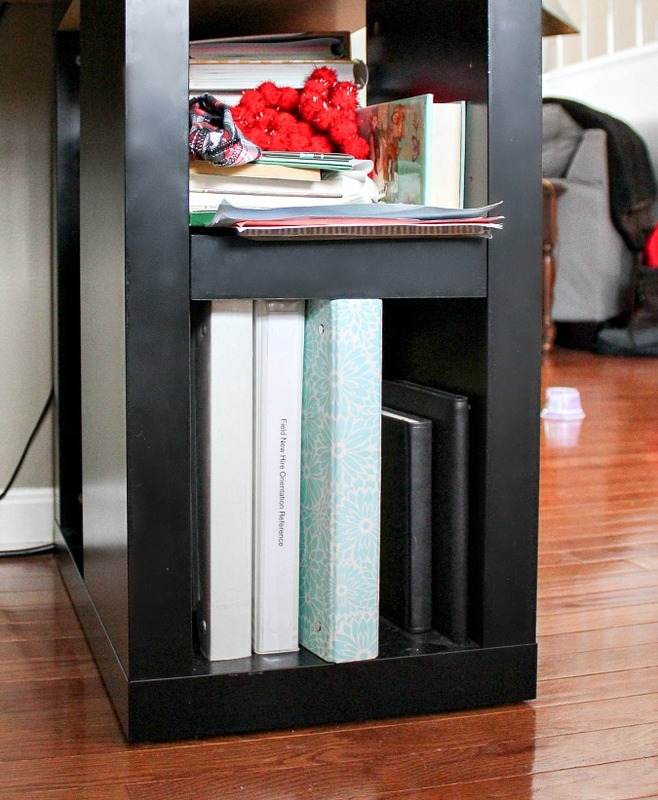 This holds a little bit of everything, and I love this piece of furniture. But it is on the list for a paint job at some point. You are also getting a glimpse here of some of my winter decor, btw. 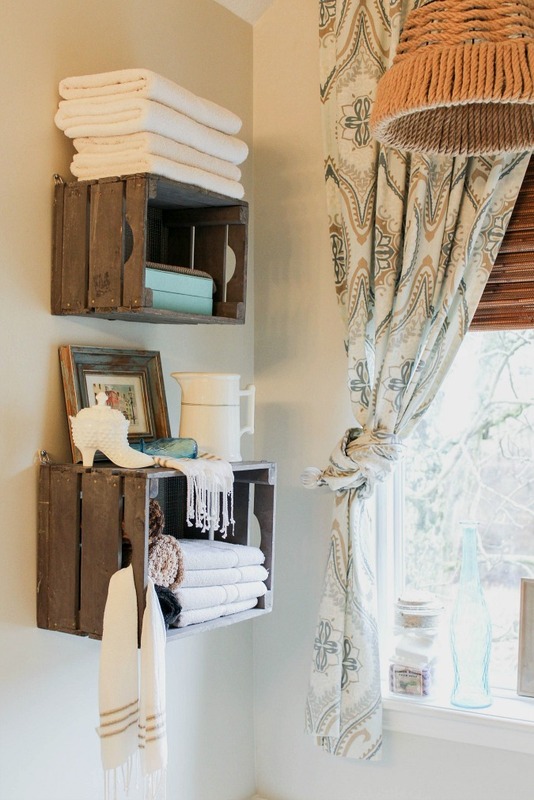 And I just love the it looks with the glass and the neutral color pallette. If you look to the left of this buffet, you can barely catch a glimpse of this large glass candleholder. It does not currently hold a candle though. I decided to use it to hold ribbon. Because the ribbon box on the shelf over the desk was no longer cutting it. 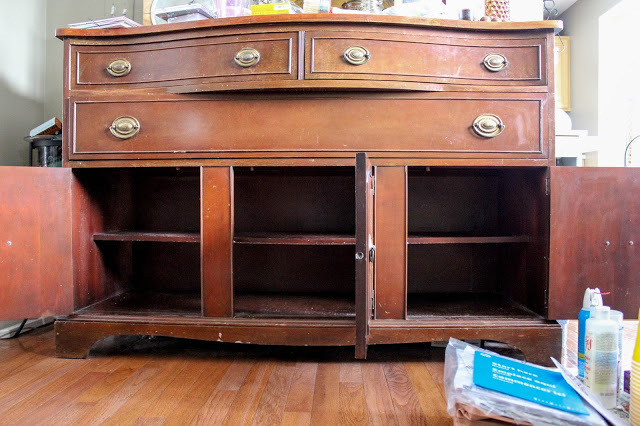 I somehow didn’t get a picture of this cabinet before I decluttered and purged, but here it is all emptied out. And here is what the room looked like when I was cleaning out the buffet. Stuff everywhere! This is the after. I got rid of enough stuff that I had the bottom right shelf completely empty, so in went these wine bottles that were just sitting in the corner of this room, because I am saving them for a future project. You can see on the bottom left a green and white file folder. It holds owners manuals. and I even went through all of these and threw a bunch of them away. The basket above holds old family video tapes that need changed over to something that isn’t obsolete. I also keep candles here, solo cups, a food processor, sewing kit and flashlights. These drawers received a purge as well. This is the before of the left drawer. Kind of a mess. And the after, which ended up changing after I took this photo. 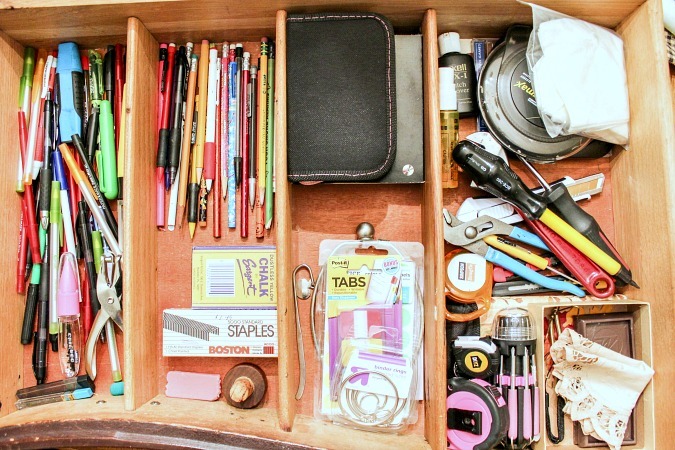 I moved the tools you see pictured over into the right hand drawer. 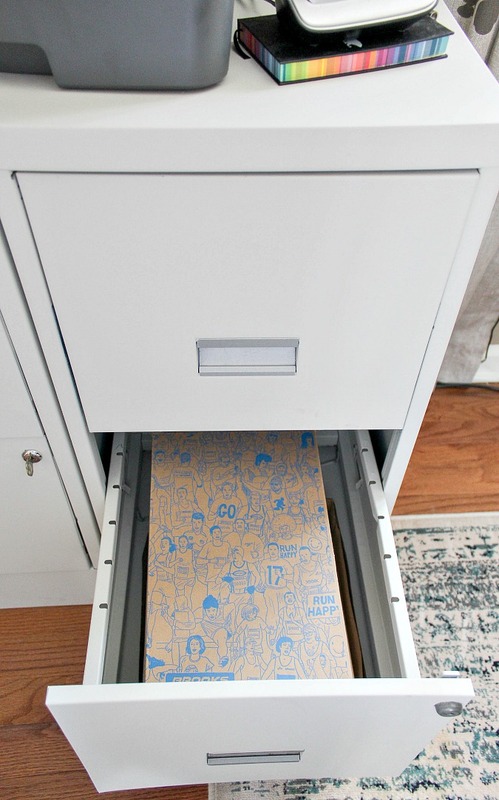 So this drawer now has some extra room. This drawer was a hot mess, as You can see in the picture below. I dreaded going through this the most I think. And this is the after, as you can see I moved the tools over. 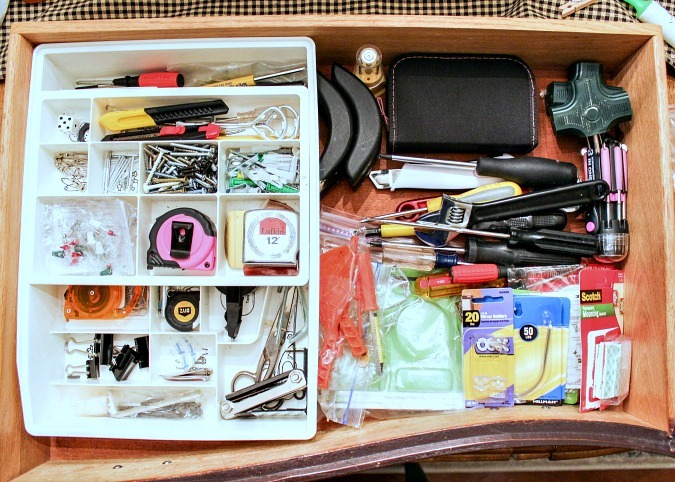 This entire drawer is mostly tools and things of the sort. We have a large tool box downstairs, but it is great for us to keep these things upstairs because they are frequently used items. So it saves us several trips up and down the stairs. 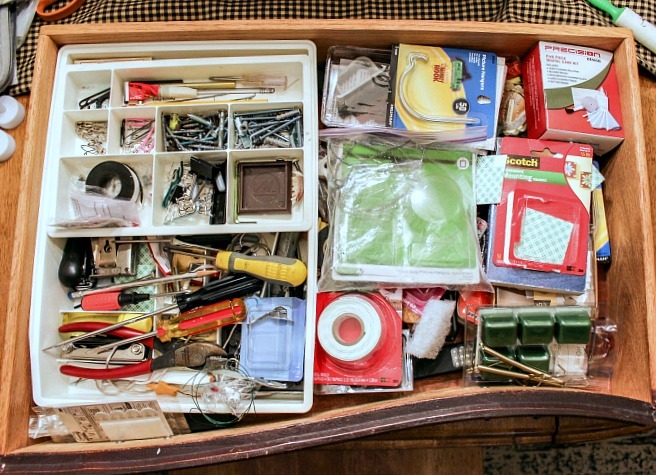 This drawer is another mish mash of items. Extension cords, place mats, Easter grass, and some school and office supplies. This cluttered and stuffed space is a huge weight off of my shoulders. I got rid of two black trash bags of stuff from this room, can you believer that? But I am so happy I did, let me tell ya! 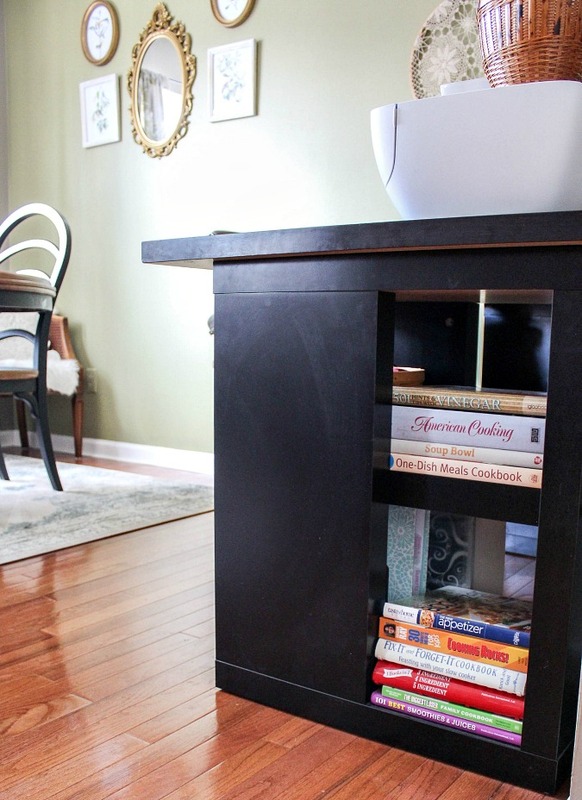 What do you think of this shared space? 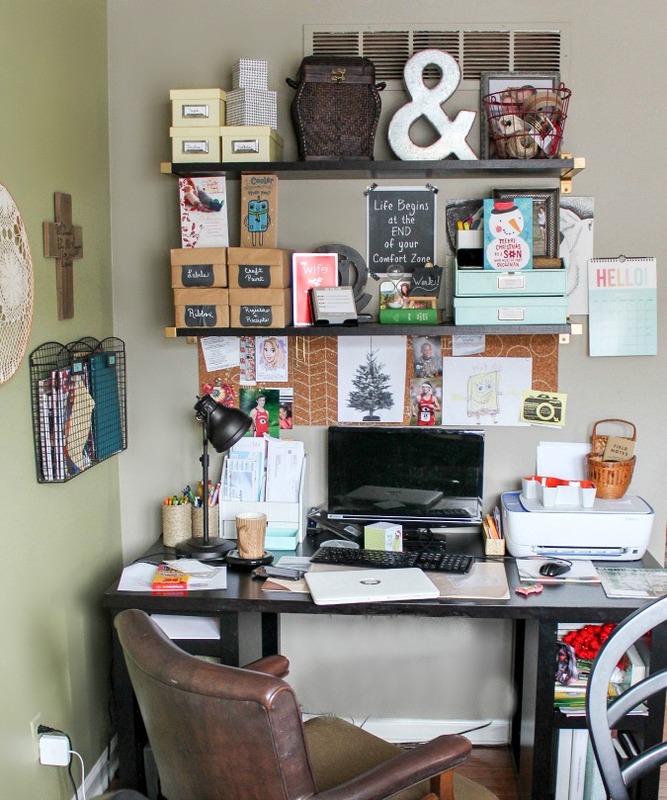 Do you have a dining room that serves as an office too? If so, please share in the comments! I love your comments and read every one! And if not, lucky you! Brag about it in the comments! Now, please pay a visit to my fellow hosts for this challenge by clicking the links below this picture. 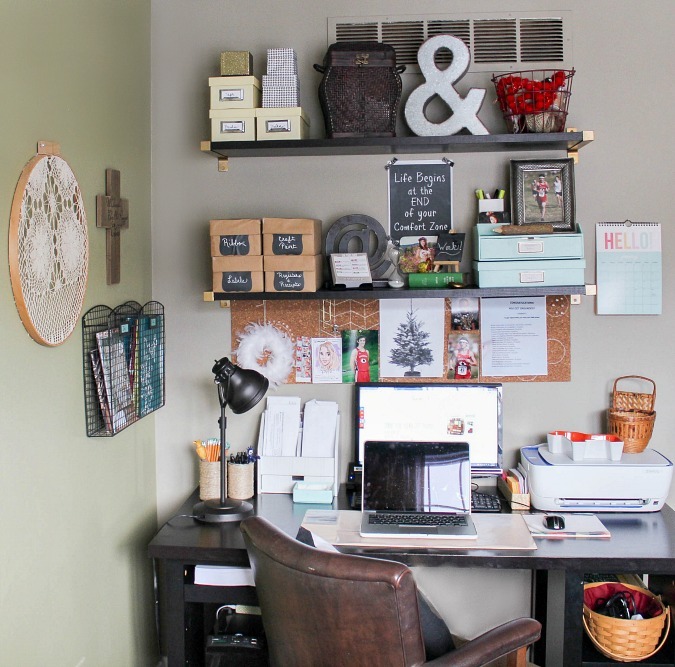 They have some amazing tips and tricks for organizing your craft/office space as well! 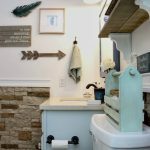 We would love to have you join our link party and add a link to a post you have written about kitchen or craft/office space organization or you can even add a picture if you don’t have a blog! And don’t forget to register to win the gift card at the bottom of the post! You do not want to miss out on that opportunity! 5. By linking up to this party, you are giving all 8 of us permission to share your pictures on social media or our blogs at any time in the future. Of course there will be a link back to your original post if it is used. 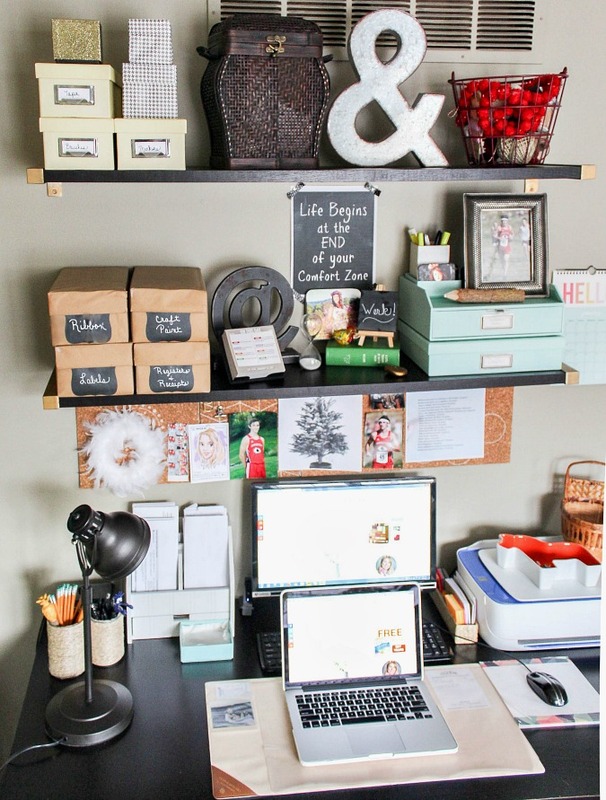 I loved all the ideas you showed us to organize our workspaces. 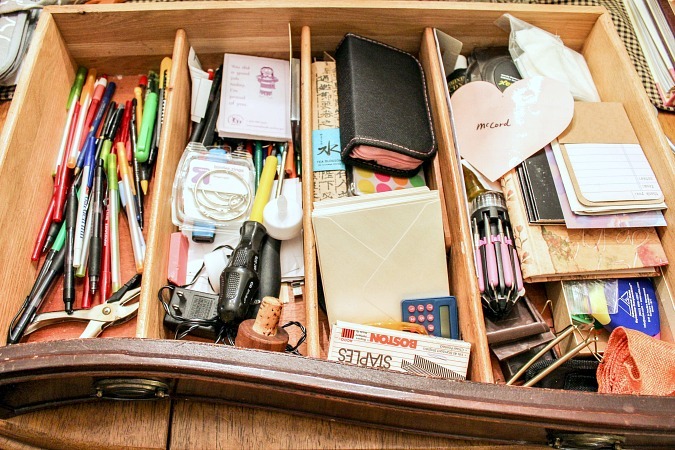 Many times we forget how organization can affect our work for good or bad. At home I´m usually a disorderly person. My books and papers are everywhere. But now that I´m renting an office at a place called Ranch office. I think my organization has improved. However I believe we should have the discipline to have order in and out home. Is it easy for you to keep this discipline?